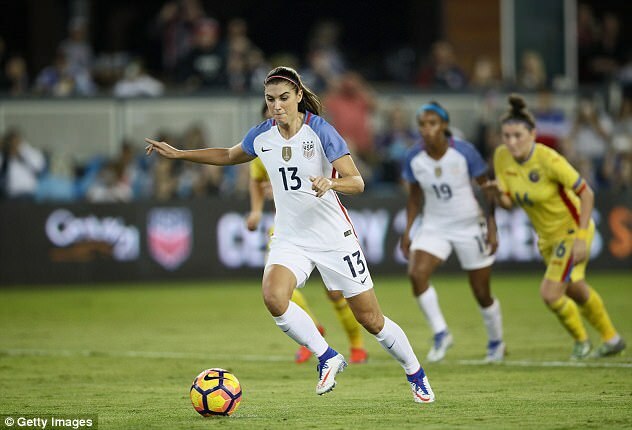 Female US soccer striker star, Alex Morgan, 28, was kicked out of Walt Disney World after an 8 hour drinking binge with friends. Certainly not the type of kick-off that she’s well known for on the soccer pitch, that’s for sure. No, this took place on the symbolic pitch of the magical Walt Disney World in Florida at the United Kingdom Pavilion area of the Epcot Center, and in pure lager lout style, Alex seemingly lost her cool after one too many “bebidas”. What has happened to America’s sweetheart? Well, alcohol, apparently. This just goes to show that the testosterone levels in female soccer players might just be likened to that of men, especially after consuming lots of alcohol. Due to this unfortunate incident, it seems that poor Alex has inadvertently joined the ranks of rowdy US soccer players like Hope Solo, who if you’ve forgotten, was that sore loser goalkeeper that publicly complained about losing to Sweden in the Rio Olympics, calling the national side a “bunch of cowards”. She was reportedly also a man beater in her private life, with a history of being domestically abusive towards her husband. Luckily for Alex, this isn’t half as bad as that, but still, nobody expected this sort of behaviour from the darling Major League Soccer star of Orlando Pride, did they? So, what happened exactly? Well, Alex Morgan was there with friends celebrating in a bar last Sunday. Major League Soccer athletes Giles Barnes and Donny Toia from the Orlando SC team were with her at the time, just hanging out down at the pub, having a few drinks and chilling. Nothing wrong with that, right? However, after 8 hours of drinking nonstop, things turned ugly. An “altercation” and argumentative stances towards Disney World staff members took place in the pub after a dispute with a patron at the bar erupted, which resulted in Alex Morgan, Giles Barnes, and Donny Toia bring forcibly removed from the park by police. What was this “altercation” and who started it? Simple. Giles Barnes decided to cut in front of somebody in the line to the bar, and this didn’t sit well with the other patron vying for a drink at around 8:20pm. This sparked an argument, which led to Alex Morgan joining in the fracas like a true man, but she was later led out of the bar and eventually the park as a whole by police, yelling and screaming the entire way out. Police deputies revealed Alex Morgan also made a reference to how she knew people in the Orlando SWAT team, which can only be considered as name dropping, at that point. Giles Barnes, the perpetrator of the incident, was also escorted out by police along with Donny Toia, who was verbally aggressive as well to the pub workers, Disney staff and the police. Officer Armando Harwood wrote in the police report when dealing with Toia: “To prevent this incident from possibly turning physical I grabbed his left arm … spun him around so he was facing away from me … and told him to keep walking towards the front of the park”. Just hours before, Alex Morgan had posted a sober and upbeat Instagram photo of the group setting out to enjoy their squeaky clean Disney World adventure at the United Kingdom Pavilion at the Epcot Center. Take a look! Yes, just a clean and innocent trip around Mickey Mouse land, but after spending hours drinking, things changed, and even though they were in the UK Pavilion, they seemingly couldn’t hold their drink as well as many Brits can. Perhaps, during Alex Morgan’s spell in Europe for the Olympic Lyonnais side, she should’ve considered playing for a UK side instead, who no doubt would’ve shown her how to hold down her pints properly. Alex, who has been married to fellow little known soccer star Servando Carrasco since 2014, reportedly got involved in the group quarrel with Giles Barnes and Donny Toia at the bar, which kept on escalating until the Orange County’s Sheriff Department was called and intervened, asking everyone involved to leave. The Sheriff said: “These are the individuals that were trespassed from Disney on October 1”. With behaviour like that, their very presence was deemed a trespass according to the codes of conduct of Walt Disney World and rightly so. Everybody involved that broke these rules were escorted off the premises post-haste. No charges or bans were filed, but it can be confirmed that Morgan, Barnes, and Toia were forcibly removed from Walt Disney World. The Orlando SC and Orlando Pride soccer teams released this statement in relation to the incident: “The Orlando City SC organization is aware of a situation that occurred at Walt Disney World’s Epcot theme park earlier this week and is awaiting official communication from Disney or the Orange County Police Department”. Then the Major League Soccer organisation added: “The club will address the matter internally when there is a full understanding of what occurred”. So, will there be hefty fines, game suspensions, and other penalty’s coming to Alex Morgan, Giles Barnes, and Donny Toia after the exact details are given to the organization by the Orange County PD, Disney World, and Mickey Mouse himself? We presume so. If anything, this just goes to show you that sports stars need to exercise better judgement in public, even if it is only the MLS league that we are talking about. These sports stars are considered heroes to many kids, especially Alex Morgan, so please, if you’re going to drink, do it with some class and poise, at the very least.